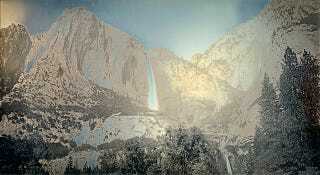 It's impossible to think about Yosemite Valley without Ansel Adams coming to mind. The photographer's countless breathtaking images of that location, and others in the western United States, shaped our perception of the region and landscape photography in general. But artists continue to bring their own experiences and techniques to the task of depicting the American West. An exhibition currently on display at the Museum of Photographic Arts in San Diego shows off the work of contemporary photographers offering unique ways of looking at this iconic subject. The show, aptly titled After Ansel Adams, includes photographs that are diverse in both material technique and subject matter. Some reference history by using obsolete processes like the Daguerrotypes of Binh Danh, while some utilize modern tools to describe the landscape as in the collages of Mark Klett and Byron Wolfe. The idea of the show is an important one: by revisiting a subject so overtaken by the weight of history and culture, we can gain new insight into how to approach something with new eyes. Even the most cliche subject matter can be looked at differently. After Ansel Adams should inspire every photographer to not be intimidated by history when going out to shoot! If you are in the San Diego area, you can visit the exhibition until September 28th. For more info, head to the Museum of Photographic Arts' website.